This plaque, on a house in Bootham, marks the birthplace of W H Auden. 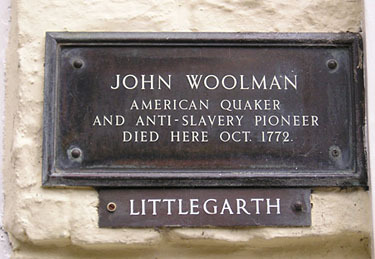 It is of course fairly common practice now to mark with a plaque the place where a famous person was born. I’ve wondered many times why we make so much of a person’s birthplace. Where we’re born is, after all, something we have absolutely no say in. Worth a plaque perhaps, for ardent fans of the individual’s work. But I never understood why it was seen by some as a case of shameful neglect when York didn’t manage to make more of the centenary of the birth of W H Auden, in 2007. Auden was here for about a year, for the first year of his life, when it can be assumed he wrote no poetry. His family then moved to Birmingham. His father, George A Auden, edited A Handbook to York and District, published in 1906. This contribution to the city is more deserving of recognition, I’d suggest, than anything young Wystan was capable of doing while living here. The book includes mention of places of interest in the Bootham and Marygate area. This house, Littlegarth, being one of them. It’s not far away from the Auden house, round a couple of corners, down Marygate and into Marygate Lane. It is marked by another bronze plaque, marking a life well-lived, at its end. An article in the York Press at the time of the Auden centenary quoted Andrew Motion, who suggested that York should be marking the event in a ‘grateful’ way. I really can’t see why York owes any gratitude to Auden, but if you can explain this remark, please feel free to comment. 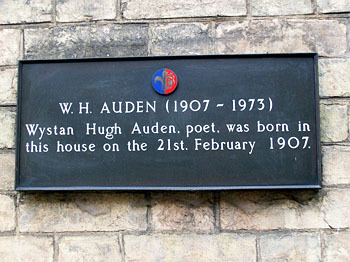 Photo of Auden plaque: Summonedbyfells on flickr.com.